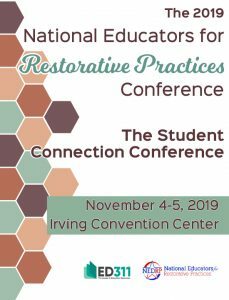 The 2019 National Educators for Restorative Practices Conference is November 4-5, 2019 at the Irving Convention Center in Irving, TX (DFW Area). Only first and last name are required. If more than 1 or 2, you can just summarize. Presenters can have 1 secondary presenter. Explain your session, why/how it would be beneficial to educators, and any specific theme(s) in less than 100 words. You can only choose one. These are the pathways we've pre-determined will appeal to our attendees and will clarify for them where your presentation fits. Student Centered - These sessions focus on classroom structures (like circles) or the classroom environment that support RP. Responsive Centered - These sessions focus on responding to conflict and confrontation, restorative conferences, and alternatives to traditional discipline. Implementation Centered - These sessions focus on the experiences of individual districts, schools, and classrooms implementing RP. Introductory Presentations - These sessions focus on theory or introductory topics on restorative practices including what RP is, why do we use RP, and the background of relational practices. Integrating Restorative – These sessions focus on how to integrate RP with other programs or initiatives (SEL, PBIS, RTI, SPED, etc.) or campus/district missions or goals. State (1-3) specific learning targets for participants. E.g. primary, secondary, principals, counselors, etc. Most sessions chosen will target a wide audience, but we do have a few spaces available for targeted sessions. List the grade levels, roles or positions that you are targeting this session towards. These terms are all qualified on your being chosen as a presenter. We will notify you of acceptance by July 26th, 2019. You will notify us of your acceptance by August 9th, 2019. You will register at the reduced speaker registration fee of $125 by August 31st and pay by the payment deadline. You acknowledge that you will be responsible for your own travel and accommodation costs. You will submit bio, pictures and social media links by September 30th, 2019. You will submit powerpoints and handouts by October 21st, 2019.